Portraits of Flemish painter Anthony van Dyke (1599-1641) are typically dark, a technique typical of the period using a semi-dark background to highlight the subject. One should never gape at a painting with less-than-just-admiration thoughts, especially standing in the Frick Collection‘s handsome West Gallery. But you have to admit, he is devastatingly handsome. In fact, Synders (in addition to being wealthy) is a Flemish painter of animals, still live and, often violent hunting scenes. How’s that for having a darker side, Christian Grey? If you have not yet been to the Frick Collection in the Upper East Side, you should take advantage of its Sunday “by donation” program. Compared to other art museums, the Frick Collection, being the former residence of Pittsburgh industrialist/collector Henry Clay Frick (1849–1919) and a museum, offers an interesting viewing experience. Painting and sculpture aside, the Gilded Age mansion, including ceiling, vase, lamp, furniture, etc., the entirety is art. Frick, in addition to being a collector of works by the Old Masters, was also a collector of portraits of beautiful women. 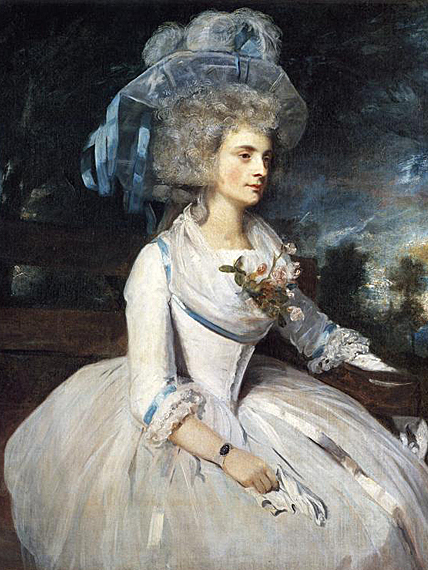 Among them, I quite adore English painter Joshua Reynolds’ (1723-1392) rendition of Lady Skipwith. The lady depicted, she married Sir Thomas George Skipwith of Newbold Hall, Warwickshire in 1785, had a reputation as a skilled horsewoman. As opposed to Synders’ black, Lady Skipwith is the absolute, varying degrees of white. Powdered hair included. What I find particularly entertaining was Reynold’s purposeful depiction of Lady Skipwith as the embodiment of melancholy typical of the romantic period. You see, in addition to characteristics like love of nature, sympathetic interest in the past, particularly the medieval, romanticism also extol morbid melancholy. The artist, in an attempt to compliment Lady Skipwith’s morose, pensive expression, painted a brooding, stormy sky as the background. What if the weather was actually sunny and not stormy? What if Lady Skipwith, a high energy, skillful horsewoman, had wanted to smile? Alas, I suppose one must embrace melancholy for the sake of art. This entry was posted in Did you know..., Travel, United States + Canada and tagged 51 shades of black, Frans Synders, Frick Collection, Van Dyke painter on May 4, 2015 by Sherry.